This model is an actual cut section of an engine starter in an automobile. 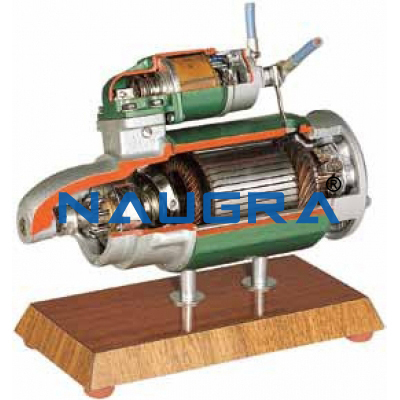 The model of demonstration sectionised model of Starter motor is been made out of original used Starter motor. The Starter motor is suitably section to show the internal details. The entire system is been suitably painted and mounted on base. The demonstration model which is very helpful to explain engine starter mechanism. We are leading manufacturers, suppliers & exporters of Starter. Contact us to get high quality designed Starter for schools, colleges, universities, research labs, laboratories and various industries. We accept bulk orders for government tenders in all countries around the globe.